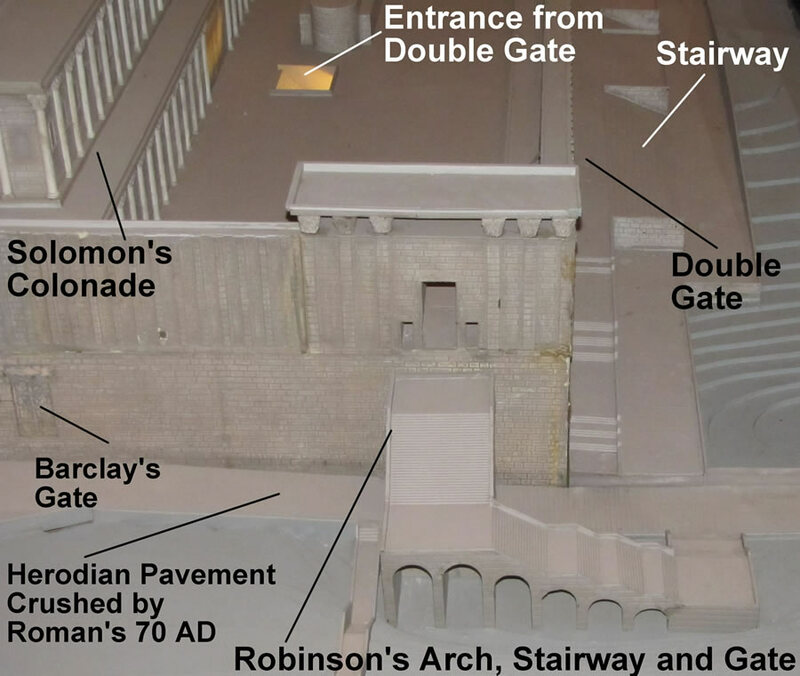 Robinson's Arch is on the south end of the western wall. It supported a staircase that led up to a gate into the Temple Mount. located the large pier built on the bedrock 41 feet directly west of the arch, which is also 50 feet long. would have been directly above this. 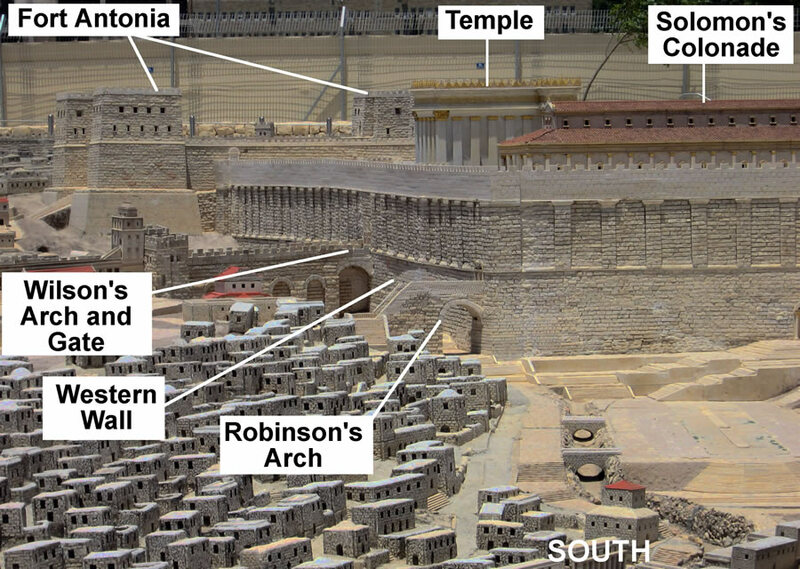 Details of a model showing the southwest corner of the Temple Mount. The staircase leading up to Robinson's Arch can be seen near the middle. Below is an early image of Robinson's Arch before excavation. 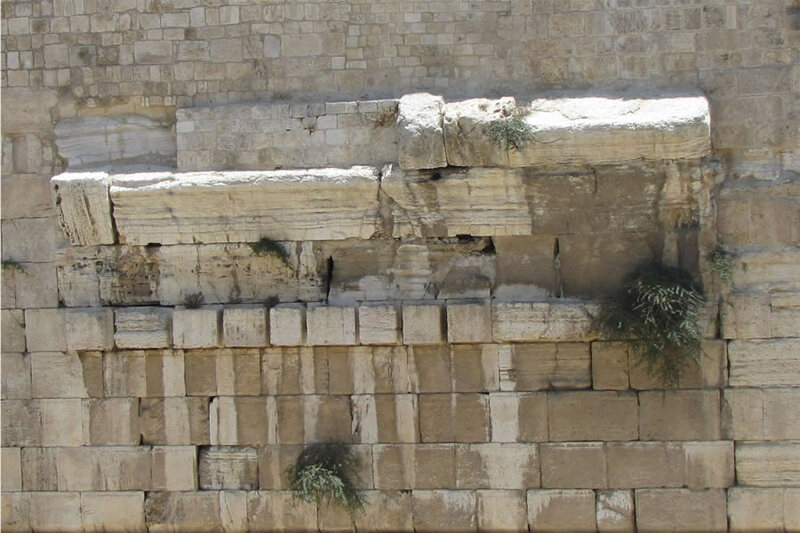 Notice the ground level is very high up on the soiuthwest wall of the Temple Mount. People could walk up and sit on the stringer of this great arch. south of the Temple Mount. 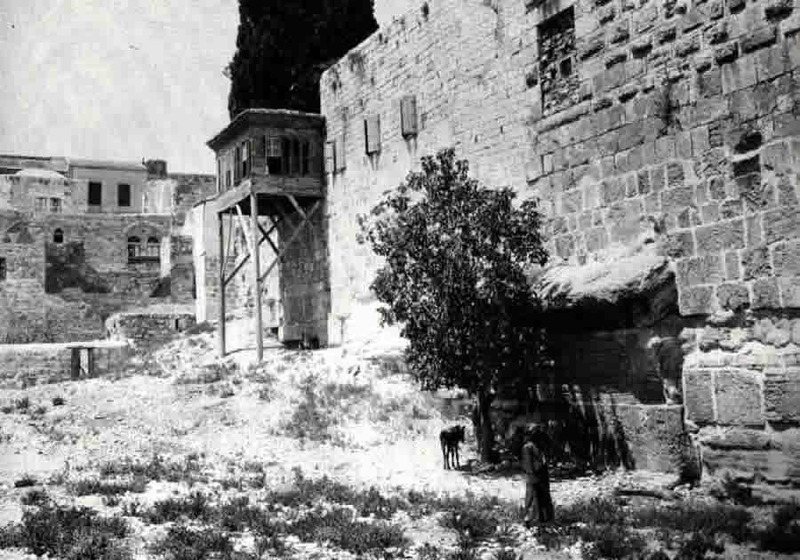 The walls of one of those buildings can be seen in the right of this photo directly behind the Temple Mount’s southern wall. 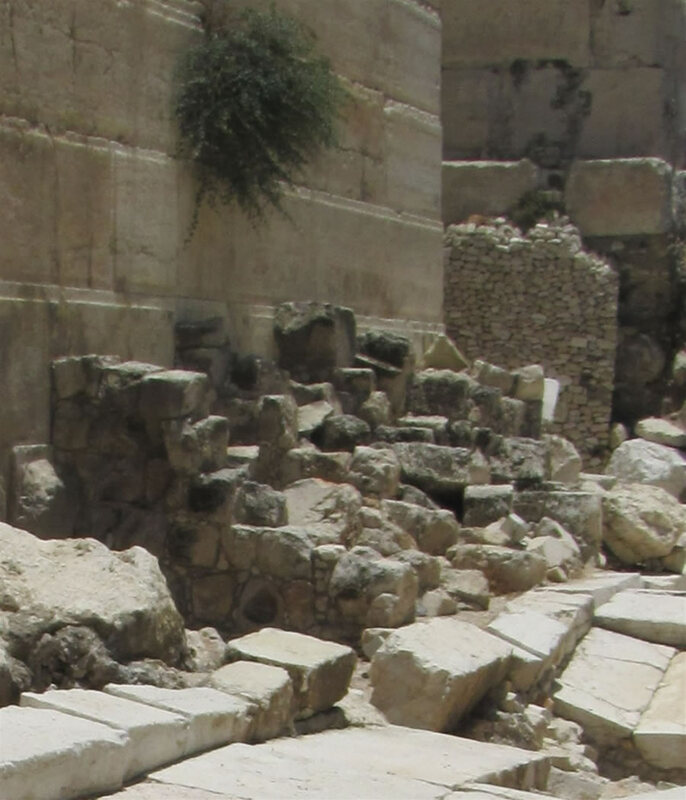 A close look at the walls of this building reveal that it was built with reused Herodian ashlar stones that were left from the Roman destruction of the Temple site in 70 AD. Reused Herodian ashlars are very common throughout the city. 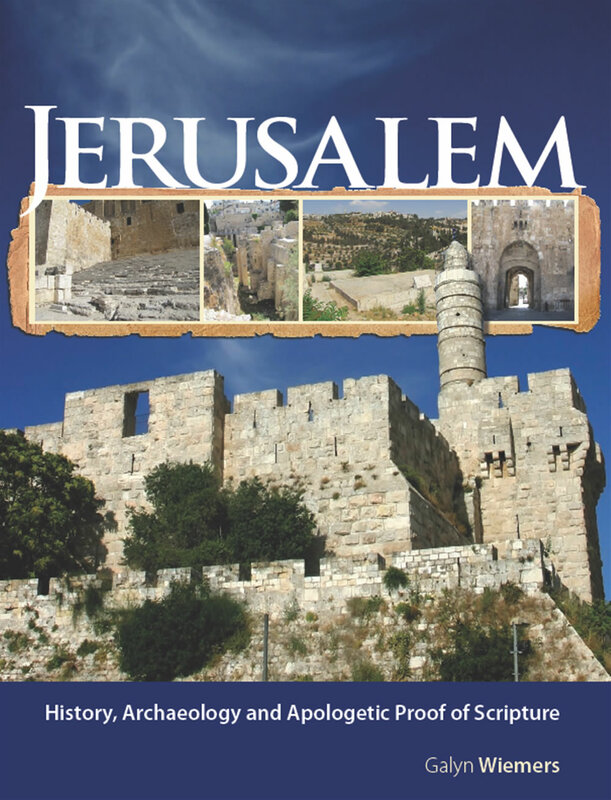 were in use in the days of Jesus when he spent time on the Temple Mount. Toni sits on the curb of the street that ran under Robinson's Arch in 30 AD. There are shops behind Toni and across the street from her under Robinson's Arch. Robinson's arch can be seen across the street from Toni. Rubble from the Temple's destruction in 70 AD lays were it fell on the crushed pavement stones. This photo presents a perspective of how high Robinson's Arch was from the street and shops below. A view of the southwest end of the Western Wall with Robinson's Arch. ground level up to the arch. Older photos of Robinson’s Arch show people touching and sitting on the Arch from ground level. This close-up shows the Herodian ashlar stones that surround the arch. the city is lower. The hill in the the back ground is south of Jerusalem. 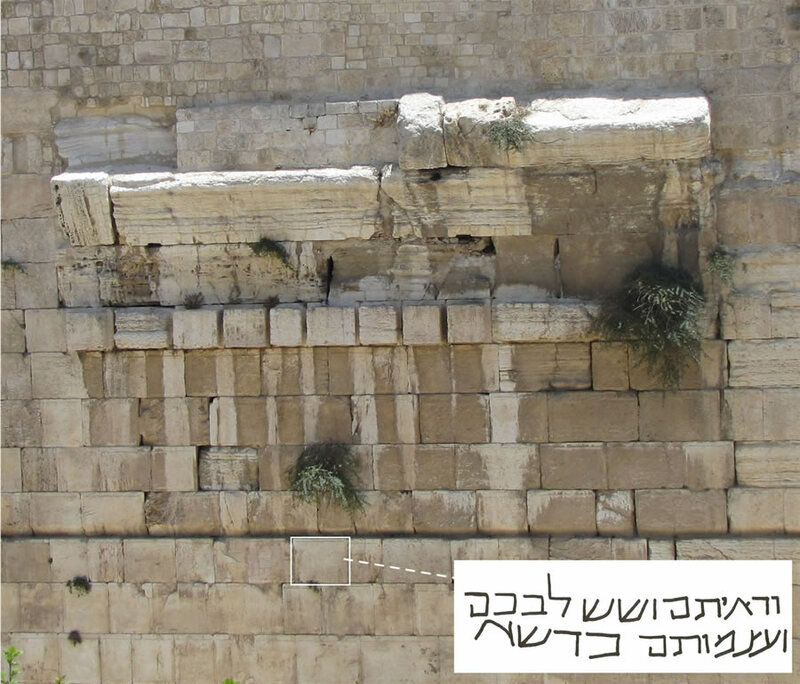 A Hebrew inscription was engraved and is visible in one of the ashlar blocks under Robinson's Arch. "You shall see and your heart shall rejoice. Their bones shall flourish like grass." The inscription may have been engraved around 900 AD to commemorate the Jewish graves found in the rubble under the arch from that same time period. You shall see and your heart shall rejoice. Their bones shall flourish like grass. When you see this, your heart will rejoice and you will flourish like grass. in Emperor Julian’s day in 363. Others recognize that about four feet below the inscription 30-40 burials had taken place around 900 AD. the stairway that led up to Robinson's arch. The remains of one of the shops whose walls also served as support for the staircase that led up to Robinson's Arch. can be seen in the bottom of this photo. Here the remains of the walls of the shops under Robinson's Arch can be seen. 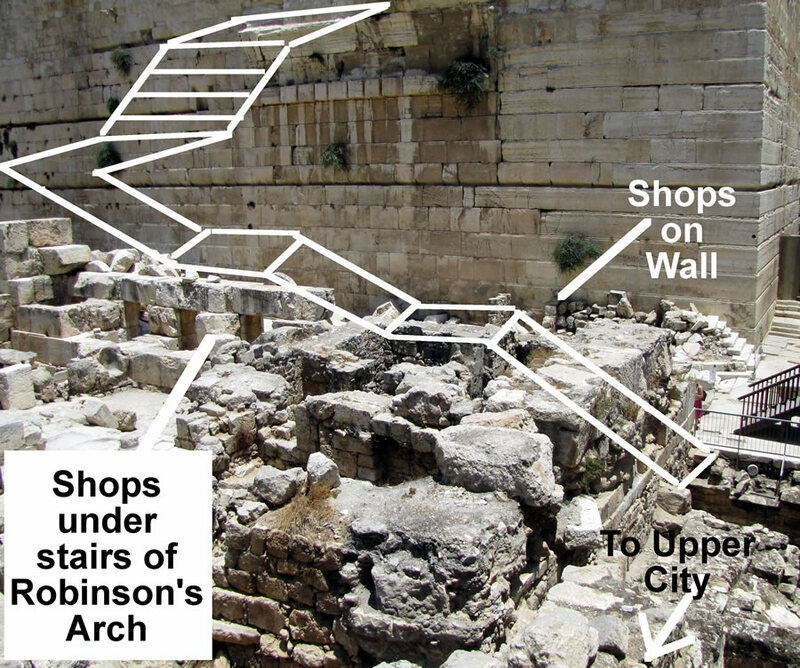 Notice to the right, at the southwest corner of the Temple Mount wall, the remains of steps that went up and over the tops of the shops. A model showing the view of Robinson's Arch from the southwest.